I have treated three horses with the WeHealPlus machine. a horse with a rear suspensory injury. has continued to tolerate a consistent increase in exercise. as I did with the rear as described above. I was delighted with the results of these two horses. tear. She was eight months into her rehab when I started. Her progress has been slower, but she is improving. Barbra Schulte is a Professional Cutting Horse Trainer, Personal Performance Coach, Author, Clinician, and Equine Consultant. Barbra has been involved with horses her entire life. Beginning in early childhood and continuing through college, she helped market and show many of her family’s 500 head of horses. She competed in western pleasure, reining, horsemanship, and cutting. After high school, Barbra went on to gain a master’s degree in Speech Pathology and Audiology. In a few short years, she became an administrator at the Arizona State School for the Deaf and taught at the University of Arizona in Tucson, Arizona. In 1983, Barbra’s love of horses led her back to the competitive arena where she embarked on a career as a Professional Horse Trainer. In 1986, after reading Mental Toughness for Sports, by Dr. James Loehr of LGE Sports Science, Inc., she began to incorporate his training techniques into her own regimen. After combining the performance enhancing strategies of the Mentally Tough program with her own wealth of experience as a trainer, Barbra began to see remarkable results. She captured the 1988 NCHA Derby, the 1992 NCHA Super Stakes Classic, and the 1992 Augusta Futurity – the first woman to wear the crowns for all three championships. 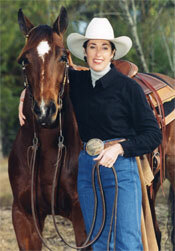 Horses and riders trained by Barbra have earned numerous national, regional, and championship titles throughout her career. In 1994, recognizing the powerful benefits of the Mentally Tough program, Schulte had a desire to share her knowledge about peak performance with other equestrians. She became certified as a Personal Performance Coach by LGE and introduced the Mentally Tough program to riders of all disciplines. She conducted clinics and seminars throughout the United States, Canada, Australia, and Europe. In 1997, Barbra produced a three-part cutting video training series and products for all disciplines outlining Mentally Tough training information. In 1998, Barbra published her first book, Cutting, One Run at a Time, providing key fundamental information for amateur and non-professional cutters learning to ride and show cutting horses. In June of 1999, Barbra and Tom’s (her husband) son, Zane, was diagnosed with Malignant Fibrous Hystiocytoma, a form of bone cancer. In June of 2000, Zane passed on leaving a legacy of inspiration that is evident in Barbra’s writings and in her life. Also in 2000, Barbra was awarded the prestigious National Female Equestrian of the Year Award given by the American Quarter Horse Association in conjunction with the Women’s Sports Foundation. This honor recognized outstanding performance and leadership in a female equestrian. Candidates for the award spanned across all disciplines recognized by the American Quarter Horse Association. In December of 2007, Barbra published her second book, THE GIFT, which contains 72 personal performance articles she wrote over a six-year period as a monthly columnist for the American Quarter Horse Association’s publication, The Journal. In 2008, she released THE GIFT in a 6-CD audio book and a workbook study format. Today, Barbra continues to train and show cutting horses. At the same time, she is expanding her education business by continually providing new online and live informational training for riders of all disciplines (regarding mental and emotional skills) and cutting horse enthusiasts. Barbra’s training is highly energized with powerful messages, tips, and skills to help riders develop their full potential, perform under pressure, and overcome fear. They learn to ride, live, and compete with focus, fun, and high positive energy. Barbra and Tom reside in Brenham, Texas. They work side-by-side in all aspects of their educational, coaching, and training businesses.